Documents must be originals or certified copies. 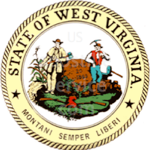 A certified copy such as a birth, marriage or death certificate, deed, will, or license can be obtained from an officer in West Virginia. A notary is not authorized to certify a copy. 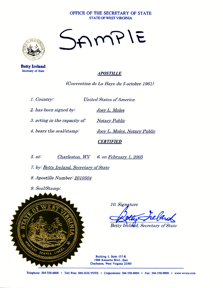 A certified copy from a County Clerk, Circuit Clerk or Registrar must have an original signature of the clerk or a deputy and a raised impression seal. A notarized document must include the proper notary affidavit (acknowledgment statement), the notary's original signature, and the notary's rubber stamp seal. A document with only the notary's signature and seal cannot be certified.